Now Fully Restored For The First Time Ever! Forget what you’ve seen in blurry bootlegs and crappy budget packs. This first-ever restoration of the depraved Canadian shocker is being hailed as the genre re-discovery of the year: In 1947, a young girl is roasted alive in a car accident. Thirty years later, her grown brother returns to their childhood home with his mentally unstable wife and sweet daughter Cathy. But when the dead aunt’s vengeful spirit possesses the child, it will unleash an unnerving nightmare of creepy mediums, demonic dolls, and plenty of sick ‘70s foul-mouthed moppet mayhem. Experience one of the strangest EXORCIST/OMEN/CARRIE-inspired grindhouse hits like never before, now transferred in 2k from recently-found film elements and featuring revealing new Extras with long-lost star Randi Allen and producer/director/co-writer Eddy Matalon. Posted in Catalogue and tagged 2017, Canuxploitation, Cathy's Curse, Killer child. 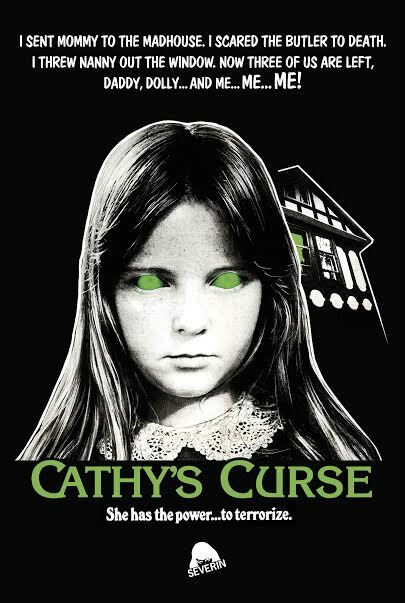 ← NewerSeverin Films to Release the Canuxploitation Classic Cathy’s Curse! Older →Two Insane ‘90s SOV Shockers Come To DVD For The First Time Ever! Hello Martin, Go ahead and place both orders and I’ll refund you half the shipping on the 2nd order. Just leave me a reminder in your checkout comments. Will that work? Thank you.